A Program About Unusual Buildings & Other Roadside Stuff re-aired June 2016. Top: Babs Bixby, Big Duck on Long Island curator. 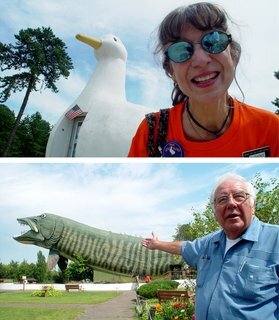 Bottom: Ted Dzilao, National Freshwater Fishing Hall of Fame executive director Celebrate some of America’s most interesting and goofy buildings, places like Long Island’s duck-shaped Big Duck and the National Fresh Water Fishing National Hall of Fame (in the shape of a five-story-tall fish) in Heyward, Wisconsin. In Mitchell, South Dakota, the unusual Corn Palace, decorated in corn and various other grains, has attracted visitors since 1892. Originally designed to convince homesteaders of the rich farming possibilities in the state, the Corn Palace is now a busy civic center celebrated every August with a festival. Host Rick Sebak presents a droll and informative look at wacky architecture that salutes all-American energy and individuality built into some unforgettable structures. 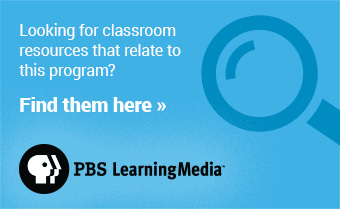 A Program About Unusual Buildings & Other Roadside Stuff was produced by Rick Sebak and WQED Multimedia Pittsburgh.